1. The early stage of the Nepali Army War College dates back to 1952 with the motto (हे वीर! हिड अधि सरी), "The Brave Leads the Way". The then Army School was initially established in Chhaunin, Kathmandu with a view to train officers and other ranks in weapon and tactics. In 1958, the School shifted to Nagarkot Barracks and Nepal Army started conducting professional Military courses. (a) 1963 (2019 BS) till 1966 (2023 BS) at Suping, Bhimphedi of Makwanpur disctrict. (b) 1966 (2023 BS) till 1972 (2029 BS) at relocated again at Nagarkot Barracks. (c) 1972 (2029 BS) till Dec 29, 1986 (14 Poush 2043 BS) at Kharipati Barracks, present day location of Nepalese Military Academy, with a wing at Nagarkot. 3. Army School was officially renamed as "The College of Combat" on 17 July 2015 (01 Shrawan 2072). Again with the decision laid by Cabinet of Ministry on 04 Falgun 2073, The College of Combat again has been upgraded to Nepali Army War College from Feb 2016 as it is know today. 4. 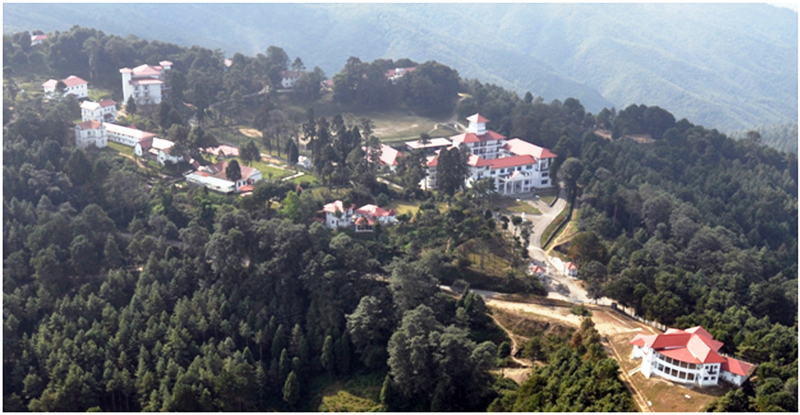 Since, the War College is continually conducting the Company Command and Staff Course (CCSC) and Unit Command and Staff Course (UCSC), the college has been entrusted with the responsibility of conducting the courses for senior officers such as Higher Command and Management Course (HCMC), thus becoming the apex training institution of Nepali Army.